@Bohnenviertel | Get Your Grub On! It was the hottest day of the year and we had celebrated my youngest sister’s birthday with some beers in the sun. It was getting late and we felt like supper, like currywurst supper to be exact. We literally walked the extra mile to reach ‘Brunnenwirt’ a tiny corner shop located in the red light area of Stuttgart – Bohnenviertel – that sells hearty grub on the go and until late. 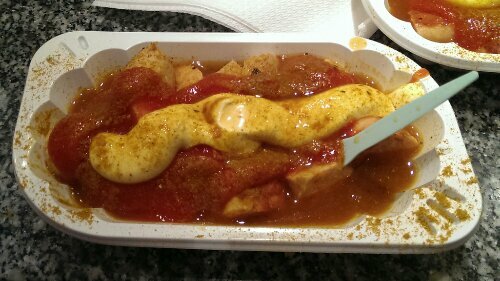 We used to come here quite frequently when we were living around the corner and therefore ordered our old time favorite, the ‘Currywurst Spezial‘. The currywurst here was an extra large skinless pork sausage that they chopped in bite sized chunks. Then all covered with ketchup (tomato sauce) and mayonnaise and sprinkled with curry powder. But the ‘spezial’ came from the dash of gravy they added from the pot in which the ‘Shashlik Skewers‘ simmer for hours. The sausage was not too strong in taste and traditionally lacked the snap because of the missing casing. The other flavors are hard to separate but the sweetness of the tomato sauce, the creaminess of the mayo, the curry taste and the meaty shashlik gravy fused together very nicely, just what we wanted after a long day in the heat. It’s quite a dodgy little corner stall with a very mixed clientele but it is also an honest place, no thrills but still clean, tasty, unhealthy junk food with a sometimes quite entertaining combination of characters around. Go check it out.